With a power output of 2100mA the power bank is good for fast charging and is your perfect travel partner. 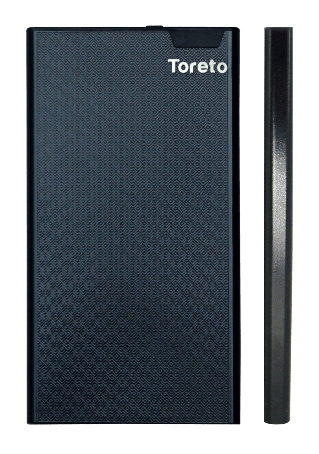 Toreto, a leader in providing consumers with complete power solutions, gadgets and accessories, released the ultra-thin, ultra-light weight and ultra-elegant & compact 6500mAh High Technology Power bank “Energy Boost” at a very affordable price for the first time in India. Energy Boost is small, the pocket size power bank has a dimension of 124.8×66.5×9.3mm, and light in weight, weighing just 135 gm is a perfect travel partner as it is slim enough to slip into your pocket. With a power output of 2100mA the power bank is excellent for fast charging and is the perfect travel partner. It isaccompanied by auto-off function as an energy-saving technology. The device is compatible with Apple, Samsung, HTC, Blackberrry, LG, Sony and all USB devices. Energy Boost is available in Black colour and features an in-built smart LED that expresses high technology and implicit style and indicates charging capacity and working status. The power bank uses Li-Polymer battery and comes with multiple protection circuit for high safety and reliability accompanied by auto-off function as an energy-saving technology. Energy Boost takes 8-9 hours to fully charged, and has a life cycle greater than 500 times that indicates high end power bank. Commenting on the new launch of Power bank “Energy Boost” Director, Toreto, Mr. Vikas Swarnakar says, “We are proud that Toreto’s cutting edge technology and portability feature makes “Energy Boost” stand out in the Power Bank market”. Smart LED indicates capacity and working status.